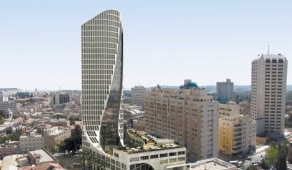 An article in today’s Haaretz divulged previously unpublished plans to build skyscrapers in downtown Jerusalem. At least one of the new buildings looks quite spiffy – a 24-story tower designed by American Jewish architect Daniel Libeskind and local architect Yigal Levi that will include 180 luxury apartments, a boutique hotel, cinemas and a theater, a commercial area and an outdoor public plaza. All told, there are 10 new projects on the books along two main corridors – Jaffa and King George Streets. The push for skyscrapers comes after the recent approval of a long awaited master plan for the city, which takes into account the cancellation of the Safdie Plan. That proposal would have built tens of thousands of apartments and low density homes in the hills west of Jerusalem. The plan was nixed due to vocal opposition by environmental groups and citizens alike, but the result is a need to build more densely in the city itself. There was a time when I was against changing the “historic” look and feel of the city, where nothing was supposed to obscure the prominence of the Old City. Except for a few eyesores like the Clal Building and Crowne Plaza, most buildings were 5-6 stories max. But that lack of density also gave the city a kind of backwards, country-bumpkin atmosphere. Downtown felt a bit pathetic compared with the “big city” Tel Aviv. And when the Malcha Mall opened years ago, the city center was decimated – all the best shops and all the movie theaters fled for the periphery. Indeed, one of the new skyscrapers will rise on the ashes of the old Eden Cinema. If these skyscrapers live up to the promise reported by Haaretz – that they will have plenty of public space, shops, restaurants, and entertainment venues – they could help revitalize downtown. The light rail, a ten-year nightmare coming to an end this summer, will also contribute, turning Jaffa Street from a car, bus and taxi clogged artery to a European-style pedestrian and trolley walkway stretching all the way from the Central Bus Station to the upscale – and very successful – Mamilla Mall. Couple all that with the fast train from Tel Aviv, and you could have the Ramat Aviv crowd zipping up the Holy City not for a trip to the Western Wall but a cappuccino at a trendy bar at Davidka Square. I don’t know if I like this. Modernization is wonderful, but Jerusalem is supposed to be untouchable. At least in my far removed American fantasy life. Daniel Libeskind is one of the worst architects anywhere. Just ask anyone in Toronto or Denver where his ugly “vision” has defaced their cities. This latest monument to Libeskind’s own ego will destroy the charachter of Jerusalem as surely as it has done in other cities where this arrogant and careless architect has forced his out-of-scale and vulgar designs. Libeskind was fired from the Freedom Tower Project in New York. He should be fired from this one before he ruins the skyline of a noble city. Please don’t let Libeskind spoil Jerusalem as he has spoiled other cities with his abominable creations. His unstoppable ego knows no limits. This inappropriate tower is just the latest example of Libeskind’s pretentious and misguided idea that it’s all about HIM. He could care less about Jerusalem or any other city he works in. Daniel Libeskind is an awful architect. I hope this never sees the light of day. In the hands of a decent architect, it should be possible to insert a modern building that will enhance the oldest, most revered historical setting. In the hands of a bombastic and talentless ego-maniac like Daniel Libeskind, the insertion will not only be crass, vulgar and out of character, but it will be a disfiguring blot on the entire skyline destroying the character of a wide area. The name “Libeskind” is almost synonymous with bad design and destroyed urbanism. I hope Jerusalem is not the latest casualty to suffer the indignity of a Libeskind design. The only thing worse than a modern high rise tower in Jerusalem is a Daniel Libeskind-designed high rise tower in Jerusalem. In London, the people rejected Libeskind’s attempt to ruin the beautiful Victoria & Albert Museum with his hideous addition. In New York Libeskind was fired from the Freedom Tower project. It is too late for Toronto where Libeskind’s brutalist museum is already on the list of the World’s Top 10 Ugliest Buildings. Don’t let Jerusalem be the next victim of the type of visual and cultural disaster that has been widely called “The Libeskind Effect”. Libeskind tried that L-Shaped “boot” idea up here in Toronto but thankfully the unbelievably stupid looking project was aborted. No he’s re-using the same old thing in Jerusalem. It’s like he just drags out an old unused set of drawings and charges another client for the same abandoned project. Whatever happened to real design? Libeskind has ruined many cities with this type of eyesore. I expected him to show more respect for Jerusalem, but I guess I was wrong. I do believe he’d build a skysraper on his own mother’s grave if you offered him plenty of money and promised him lots of news coverage for it. It’s sad, really sad to see Jerusalem subjected to such selfish motives. The vulgar editions that Israel is introducing to the original Arab skyline, will only reaffirm how insensitive and tacky the modern history of Israel will appear in time. Israel is often seen as a place of conflict and strife. In reality there is much more: there's business and research; art and culture; community and family. At ISRAELITY, Israelis blog their daily thoughts, experiences and insights. It's the real Israel, not the media's Israel. It's people living ordinary lives in an extraordinary place.